Reading this book felt partially like a review of what I'm learning in my Roman History class. There was a good portion of the beginning where as I was reading it, I went "That's true, that's true." It's a testament to how much fact checking and research Jennifer A. Nielsen did for this book. 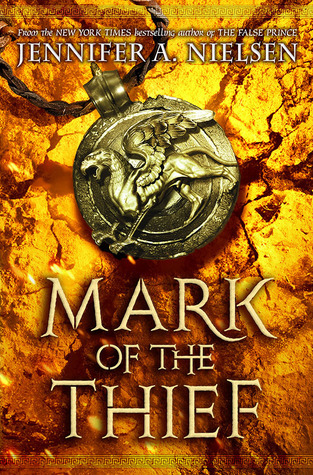 THE MARK OF THE THIEF is about Nic, a slave that has found himself in possession of a bulla, a golden pendant sort of thing, that once belonged to Julius Caesar and granted him magical powers. Caesar's bulla is known to grant powers and those that would desire the fall of the Roman Empire will stop at nothing to acquire the bulla. It is up to Nic to learn to control his powers and to save the Empire. In true Roman fashion, the novel is peppered with betrayals and people working in their own self interest. Felix says it best, "Before you can understand Rome, you must understand where we began. We are a product of our history of violence, betrayal and blood." (P80) And in this way, it is hard to know who will truly help Nic and that they are not working towards one of their own goals we are unaware of. Jennifer A. Nielsen seems to have a knack for adding twists and turns to her novels and it's a great joy for me to read her novels. I highly enjoyed this one and I can not wait to start the next one.